Finely shred cabbage. Combine cabbage, salt, sugar and fish sauce in a large bowl and let rest for 30 minutes. Finely slice scallions, white and green parts. Grate garlic and ginger on a fine grater. Add scallions, ginger, garlic and chili flakes to the cabbage mixture, tossing to combine. Pack mixture and juice into a quart jar. It should just fit. If needed, pack excess into another smaller glass jar. Cover with an airlock-enabled lid, or with loose plastic wrap sealed with a rubber band. Let the kimchi sit at room temperature for 4 days, releasing the pressure daily if using plastic wrap. Press the mixture down if it rises above the liquid line. A jar weight may also be used to keep the cabbage submerged. After 4 days, stir the mixture, pack it down again and top with a regular lid. Store in the in a cool dark place for at least a week longer before eating, then refrigerateT. 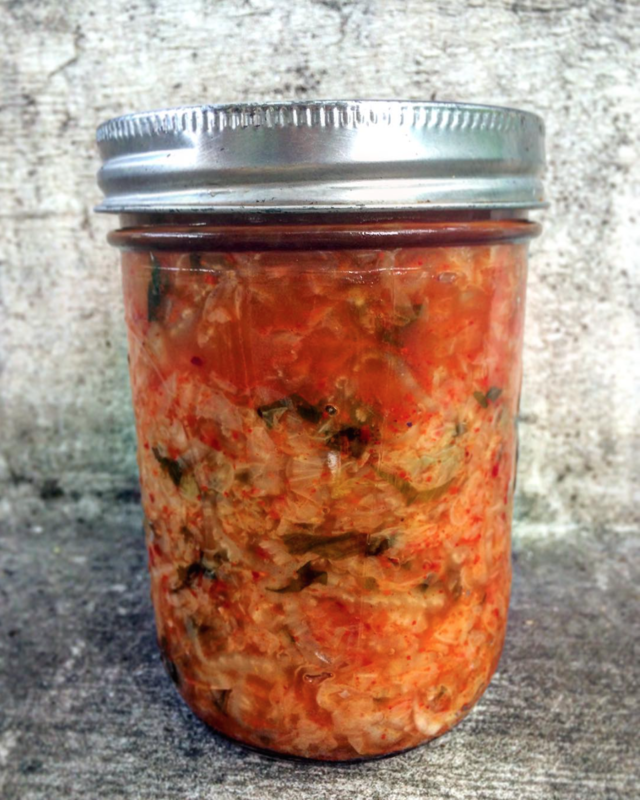 Kimchi will easily last 3 months in the refrigerator before the texture becomes to mushy. The kimchi gets more sour and hot over time. Supply notes – Gochugaru (Korean Red Hot Chili Pepper Flakes)orean Red Chili Flakes can be purchased at your local Asian supermarket, or online. I like the organic variety. Jar weights and airlocks can be purchase online. These are handy for holding down veggies in brine. I like the ones at FARMcurious.